The dry bark of Albizia julibrissin Durazz. of family Pulse. Jiangsu, Zhejiang and Anhui provinces and so on in China. Slightly fragrant smell, slight astringency and light taste; when eating first slight stabbing sensation on the tongue then discomfortable sensation in the throat. Thin and even, without cork and with yellowish white in internal surface. Dried in the sun, sliced and unprocessed. Sweet, neutral; heart, liver and lung meridians entered. Induce tranquilization and relieve depression, activate blood and relieve swelling. It can relieve liver qi stagnation to amuse heart and induce tranquilization. It can be indicated for restlessness, insomnia, amnesia and dream-disturbed sleep caused by depression, angry, worry or gloomy and so on. 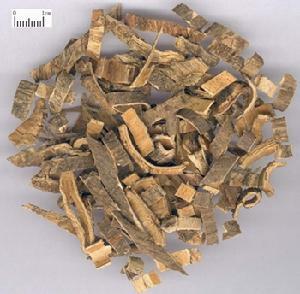 It is used singly or combined with herbs to calm liver and amuse heart to obtain the action of inducing tranquilization and relieving depression such as Bai Zi Ren, Shou Wu Teng and Yu Jin and so on. It has actions of activating blood and resolving stasis and relieving swelling and alleviating pain with heart, liver and blood system entered property. For traumatic injure, fracture with swelling and pain, it is often combined with blood-activating and trauma-curing herbs and fractured tendon and bone-reuniting herbs. For instance, it is combined with Tao Ren, Ru Xiang and Gu Sui Bu and so on. It has actions of activating blood and relieving swelling, so it can be indicated for both external and internal abscess. For abscess of lung with symptoms such as chest pain, coughing and vomiting of pus and blood, it is often combined with heat-clearing and toxicity-relieving herbs and abscess-curing and pus-expelling herbs. For instance, it is combined with Yu Xing Cao, Tao Ren and Dong Gua Ren and so on. For sores and abscesses, it is combined with heat-clearing and toxicity-relieving herbs, such as Pu Gong Ying, Zi Hua Di Ding and Lian Qiao and so on.